This outdoor sculpture is based on two 10ft cast-iron columns I scavenged from a demolition site in my neighborhood in May 2018. The columns came from a very typical 3-story brick building from 1920, located at 535 Grand Street in Williamsburg Brooklyn. This building had been the site of a dry goods store from 1920-1976, and the site will be turned into a luxury apartment building. 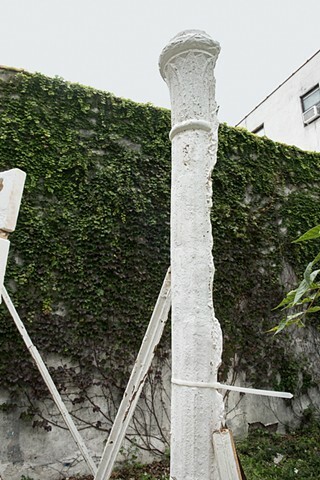 These columns, seen in-situ before their demolition, were wrenched from their original site, and serve as a reminder of the lives lived at this location. They speak to how we (as city dwellers,) encounter negative and positive space related to demolition, construction, rapid development, and the way that we experience space over time. The project uses two castings of the original cast-iron columns. The pair of castings were made not as full columns, but cast as one half of each column, with one cast in positive and one in negative. The wood shoring that holds the pieces are found wood moldings, mostly scavenged from apartment building renovations in Williamsburg Brooklyn.